In this CD we are presented with a collection of American standards interpreted by a singer who is a firm believer in the charm (and importance) of the lyric. Agneta Baumann chooses to sing only those songs with which she has developed an emotional affinity and a genuinely deep feeling for the words as well as the music. With a little sense of imagination and adventure on the part of the listener one can embark on a sequence of events via the song titles and the contents of their lyrics. "Comes love, nothing can be done....." Exactly. That is what this aspect of life seems to be all about. - Her co-musicians are Bosse Broberg (trp), Gösta Rundqvist (p), Hans Backenroth (b), Johan Löfcrantz (dr). Recorded in June, 1999 in Stockholm. "Jazz musicians should know the lyrics of the songs they play". This was "The President" Lester Young's sincere belief with which he conceived the melodic fragrance of his tenor sax improvisations. Dexter Gordon, when on stage, often used to introduce his American standard repertoire, especially ballads, by reciting the lyrics of the opening bars in his deep sonorous voice, as if to prepare his audiences for the thought processes behind his treatment of the songs. The popularity of such lasting evergreens as "Stardust" and "Body and Soul" for all their melodic qualities can be partly attributed to the fact that the lyrics awaken bittersweet moods and feelings which endear them to the listeners. Virtually all the songs which make up what has become known as "The Great American Songbook" contain lyrics which give the ambitious singer endless possibilities to extend his or her expressive talents. It is sometimes surprising to discover that some of these artists seem to have almost missed this point and consequently often leave the listener with a feeling of emotional emptiness, however skilfully they may have negotiated the melodic and harmonic aspects of their material. Of course Billie Holiday created her own standards of giving a larger-than-life meaning to the words she was singing, perhaps even unintentionally, as ironically enough she stated that it was actually her ambition to sound like a horn. Perhaps that is why her association with Lester Young resulted in such exquisite examples of voice and instrument in harmony, creating such great and lasting jazz music. In this CD we are presented with a collection of American standards interpreted by a singer who is a firm believer in the charm (and importance) of the lyric. Agneta Baumann even goes as far as to say that she chooses to sing only those songs with which she has developed an emotional affinity and a genuinely deep feeling for the words as well as the music. It is worth bearing this in mind when listening to this CD in order to fully appreciate Agneta's qualities in this respect. With a little sense of imagination and adventure on the part of the listener one can embark on a sequence of events via the song titles and the contents of their lyrics. As is often the case they are all about human relationships - and love in particular. "Comes love, nothing can be done...." Exactly. That is what this aspect of life, with its continual ups and downs, seems to be all about. As the CD spins the words seem to reflect a myriad of feelings and associations that each one of us can experience from time to time in our lives. Not only are the titles meaningful but the substance of the songs seems to flow like the river of life itself ..."might as well give up that fight again... don't try hiding, there isn't any use ...when you're near there's such an air of spring... confidentially, I've got a dream....maybe I'm a fool but it's fun....two rooms, a kitchen I'm sure would do....that carpet-ride is always worth a try....why should I care, life's is one long jubilee" But then love turns a corner and suddenly it's quite a different story - "just disappear, I care for you much too much.....I believed in everything like a child of three....in my heart there's no gladness.....now, I even have to scratch my back myself.... I thought that I would be in heaven, but I'm only up a tree.....of course you couldn't know, I haven't changed - I still love you so." Every listener has personal experiences that are mirrored in lyrics such as these. Although Agneta would be the first to acknowledge Billie Holiday's influence ("Lady Day" made recordings of several of the songs on this CD) there is a stronger association with the girl jazz singers of the '50s and '60s, such as Anita O'Day, Chris Connor, Julie London and June Christy with their husky, after-hours nightclub aura, and she captures it well. However, in the last track on this CD, "What's New", Agneta conveys moments of deep poignancy in a way that is all her very own. Listen as she delivers the words "Gee but it's nice to see you again" - and hold on to your hearts as she continues into the "bridge" of the song with its desperate cry of longing. Naturally, much of the interpretation of these wonderful songs depends on the support and contributions from the group backing the singer, if "backing" is an adequate enough word for what the musicians on this CD have accomplished. It was quite a daring choice to feature the intensive trumpet of Bosse Broberg. The trumpet, by way of its strident attack, is not always the first instrument that singers (and female singers in particular) choose to have in close proximity when performing "live", and on recording sessions. There are notable exceptions such as the essential albums by Ella Fitzgerald with Louis Armstrong, and those Mercury records with Clifford Brown behind Helen Merrill, Sarah Vaughan and Dinah Washington. Here Bosse Broberg with his burnished tone also uses his selection of mutes (particularly the "Harmon") to full effect, both as a perfect foil to Agneta's voice in his obligato backgrounds, and in his solos, which for these ears are some of the best examples of his totally committed playing on record. The intensity of such expression would come to no avail without the complement of a wide-awake rhythm section. In this case there was no need to worry. Gösta Rundqvist is the complete artist of the piano keyboard both as a soloist and accompanist. In particular, his beautiful introduction to "There's No You" followed by 16 bars alone with Agneta sets a mood that develops and blossoms out during the interpretation of the song. The ubiquitous Hans Backenroth on bass once again proves what an extraordinarily talented musician he is on this instrument. His solos are object-lessons in the art of intelligent bass playing, while he produces a beat which flows as smoothly as a perfect ski-ride. Johan Löfcrantz too, on the drums, contributes taste, swing and ideas both when playing brushes and sticks. One has only to listen to the rhythmic vitality of his cymbal work on, for instance, "Thou Swell" to realise why he is in such demand by so many top-ranking jazz musicians in Sweden. 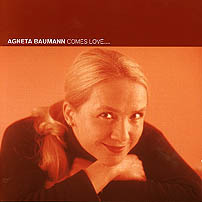 Agneta Baumann surely must have been floating on a cloud with these musicians behind her, and the directness of the emotional appeal with which she interprets these melodies and lyrics is an indication of the successful collaboration between singer and musicians. Generally, in song interpretations, the charm of the lyric may not always be apparent at first, but listening to this collection of well known, and also not-so-well-known standards, one can understand the profundity behind Lester Young's opening statement. There is a story that he once stood listening to a young "hip" saxophonist who had just completed playing an excessively long and tedious solo consisting of as many bebop "licks" as he could muster. At this point Lester leant forward smiling and whispered in his ear - "Yes,.....but can you sing me a song". I'm quite certain that "Prez" would have preferred listening to Agneta Baumann. The charm of the lyric is in good hands. "She has a pleasingly husky sound, akin to that of Anita O'Day"
"[...] the rythm section finding a smoothly swinging groove throughout." "The trumpet solos are well taken, especially when Harmon-muted, and fit the mood of the set"
"Very good sound and good insert note by Dave Castle"
"This singer is certainly someone whose fututre work I shall eagerly await." "Agneta's previous CD 'A Time for Love' [...] was somewhat sensational and now she definitively consolidates her position." "She also has had the good judgement to choose songs with good lyrics, something which makes her trustworthy and gives her singing a feeling of authenticity and honesty." "Rhythmically Agneta is exceedingly solid and her intonation as well as her phrasing is completely irreproachable." "Her surrounding on "Comes Love…." is about the best you will find on these latitudes." "This record has almost subscribed for space on my CD-player." "She has had the good taste to choose surroundings of musicians of very high standard". "She has a most pleasant voice, but above all a voice of her own, without bad habits but it's easy to trace her vocal model Billie Holiday. But also Anita O'Day [...] Anita O'Day, however, didn't have such an able double-bass player as Agneta O'Baumann." "Agneta Baumann's vocal progress is remarkable. Her phrasing, way of articulating and intonation are subtle, the choice of the melodic material delicious and musicians as trumpeter Bosse Broberg and pianist Gösta Rundquist catch the atmosphere."